Theme: Many aspects of development in Usulután and in El Salvador as a whole, with special emphasis on agriculture and forestry. Martin Mowforth (MM): First, I know that you have organic agricultural production programmes. Could you describe some of those programmes? Ernesto (E): My name is Erni, del CID [International Cooperation for Development] and I’m a promoter of the coffee project. We’re working in Berlín, and also in Tecapán and San Francisco Javier and the north of San Agustín. 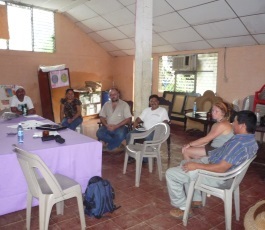 There are fifteen groups which we organise, and they’ve been helped with a finca plan. In the finca plan they tell us how many years they have had their cafetal. The cafetals generally last from 70 to 80 years – that’s their useful life span. So in the plan they specify the activities which they are going to carry out and those that they’ve already completed. In the organised groups we are working to produce organic leaf mulches and organic fertilisers. Also we’re trying to work out the best ways to re-activate a finca, putting together the saplings from old bushes with those from young bushes. We’ve got 150 producers organised. We’ve begun work with them and they are pleased with it, so much so that they are no longer applying chemicals. MM: Are there still lands here which are contaminated with chemical residues from previous production? Jaime Coutts (JC): In Berlín for example, there are producers who …?? ?… Obviously if you have an organic finca below [on lower ground] and a finca that uses chemicals above [on higher ground] there is the possibility of the transfer of chemical residues. In this case, we can use physical barriers and run-off channels for the water along with a buffer strip of land. Heavy chemicals like DDT leave you with land that can’t be used for years; whereas with lighter chemicals you can still use the land. But, as Ernest says, of the 150 producers, there are 50 certified with 124 manzanas of land, 43 hectares of coffee certified by the German company BCS. MM: As for organic fertilisers / compost, the producers make their own compost or do you have a centre for the production of compost here so that you can distribute it? JC: No. We used to do it like that before. Today we’ve reached a productivity level where it’s done in groups. We’re certified under the GTO quality certification. The community organises itself … in Socorro Bautista there are 17 compañeros who with the help of one compañero from elsewhere make their own mulches and their own composts on their fincas. In other cases, they buy products like B80 and other foliars (mulches) which are produced in the US and other countries and are imported. MM: But you have a coffee processing plant. You could use the waste material for the production of compost? JC: We are working towards that with COMUS’s project. For example, when we have 300 quintals of processed coffee in the plant, it gives approximately five wagonloads of pulp. If we buy two wagonloads of turkey or chicken manure, we can apply a process known as bocache. We can use this at the rate of between 1 and 3 litres per plant. So our aim is to create our own centre of collection and processing. So as far as your question goes, we are processing it here and the producer receives his … of bocache. Some of them have just taken the pulp and nothing else, but that’s costly. MM: On another issue, does COMUS involve itself in the delivery of potable water or in collection and storage systems of water for irrigation? Juan Rodríguez (JR): My name is Juan Rodriguez. Before talking on the issue of water, it’s important to relate something about the production of the same organic coffee project. This is to the north … of the micro hydrographic basins in the area of our coverage. There’s an activity aimed at improving the soils with a kind of filleting to allow the accumulation of organic material but also the capture of water. In this framework I think it’s important to mention that in the last three years we have been developing a series of efforts with this aim in mind and we have been selecting the producers, with 60 manzanas of cafetales, managing a production yield of 400 libretas per manzana. This implies that for each libreta we would need more or less a barrel of water during our winter [dry season] for each row. That implies that each manzana would need around 60 barrels in the rainy season. 400 barrels for 60 manzanas is a good quantity of water which can be captured and consequently it supplies the water tables which supply the national population. In that sense, there is a sector which is ready to have water. On the other hand, there are zones and communities which don’t have a service of potable water. These communities, and there are quite a few of them to the north where the water is captured, don’t have access to potable water. So there we’ve been working on the construction of systems for capturing rainwater. In some communities it is for consumption, as in the case of La Concha which is where the coffee project is – there they have built water storage tanks. And this year we’ve been working on the theme of training for the use of the cisterns which run the community water projects. We’ve also been doing training in the financial aspects, which implies ensuring the economic sustainability of the community water systems, but also with a medium term vision of not only the amount of water collected but also how to make good use of it and what works to do to ensure the recharging of the water table so that it feeds the wells which supply some of the families. MM: Have the water tables been contaminated? JR: Yes, although it wasn’t really COMUS who did this exercise; rather, almost four years ago there was an organisation here in San Francisco Javier which carried out various analyses and found contamination through agrochemicals. Chico Peña (CP): My name is Chico Peña. Just to give a little support to what my colleague was saying, COMUS doesn’t supply water. What COMUS does is to accompany the communities so that they can resolve some of the problems associated with water supply when they arise. Still in 2010 a good part of the people that COMUS deals with don’t have a water supply. So their consumption is from artisanal wells, a hole from which they can get water with pitchers or tins. MM: Has COMUS been involved in the drilling of wells? CP: These wells were more family wells. The families drill them, take out the water and thus supply the community. It was a form of community water supply. With our accompaniment which COMUS develops with the communities in the process of our work, we manage some water projects. Now 90 per cent of the communities covered by COMUS already have their own projects of potable water supply, administered by the community, and now there are wells which are not artisanal but which are a more family based potable water supply. There are some communities which still have not managed this and it’s going to be difficult for them because they are generally high zones where it’s very difficult to get a potable water system to them. It’s more in the accompaniment which COMUS develops that we improve the use of the water resources and the water table that we have. Here in the area covered by COMUS there are five or six water administrators with a network of four or five communities where they manage those water projects. We are clear that in the Greater San Salvador area, for example, the big companies, like Coca Cola and all those that have bottling plants are already exhausting supplies. Right now with the famous AdA, with the Association Agreement with the people of Europe, we think that the water crisis is going to get worse because I imagine that it will bring some interests here and one of those interests could be water. So that means that the problem of water is going to get worse every day. COMUS’s work, through its accompaniment, is to strengthen the water tables which we still have. MM: In all this business about water, where is ANDA (the National Administration of Aquaducts and Sewers)? CP: The situation is that centrally, here in the urban area, as we say as good Salvadorans, it’s being administered by ANDA, but that’s the only place where it’s administered by ANDA. In 2001, I think, the idea of decentralisation of water management was being put forward in all these municipalities. So this was one of the municipalities which was going to be decentralised and where management was going to be passed over to the community. But the earthquakes happened and so it was all left as it had been and ANDA continued to administer the water systems in the urban areas. The situation now is that the systems approved by, for example Japan which has supported lots of these projects that we are developing, the financial and political body comes along and says “the project is now the community’s, the community administers it and it is yours.” Well, this project couldn’t be given to ANDA. On the one hand, ANDA isn’t interested in community projects; and on the other hand, there is the same conditioning of the project so that it can be administered by the community. Here, throughout the whole zone, the administration is being given to the community. JC: To support what Chico says, we need to revive the political juncture that existed in the year 2001. There was a multimillion dollar robbery scandal [The Perla effect – see the book] – some multimillionaire officials took loads of money via an ANDA project. So the agencies, like the Japanese agency, don’t want to finance people who are taking advantage of the system, and they demanded that, if there were new community projects or new expansions, ANDA should be left out of the management of the funds. So you have to get approval for the plans to be administered by the people. It’s a very easy way of saying …?? ?… our water and when the people don’t control it – because that’s the problem we have in …?? ?… right now the people are so poor that they don’t have to pay for the water, so they use great quantities of it. But who subsidises this? …?? ?… To some extent, …?? ?… the cost of all these operations, because it’s not an appropriate way. So it’s a double-edged sword. MM: Do you have any renewable energy programmes in the communities? Estela Anzora (EA): We’ve been investigating the alternatives that we can use. But the one mentioned most is solar panels. Although they could be a real alternative, at the moment we think they are too expensive, for which reason we have not yet got into these. MM: Depends on the price of the panels. In your area of influence in this zone, do you have any problems caused by metal mining? MM: Is that the problem of Pacific Rim? MM: Do they have plans to come into your zone? MM: So there’s no gold in your zone? MM: One issue on which I’m sure you can talk a lot is that of deforestation and reforestation. I know that you’ve got reforestation programmes going. Can you describe them? EA: COMUS has been working since 1992 and onwards to ensure that there is no massive deforestation in the zone where we work, but yes, it has happened in other zones. So we’ve been making an effort to implement various alternatives, such as the organic coffee programme. Also there are other actions like the fincas integrated with fruit trees. In that way we’ve managed to stop large-scale deforestation as it happens in other places. When people have their own land, however, we can’t control what they do despite the fact that there are by-laws. In this municipality, for example, there’s an environmental by-law, although sadly it’s one of the things that are not applied. As COMUS has been working on this, it has an awareness of how to improve the environment, but it’s a major work and we have challenges. CP: The situation we live in in this zone which is not a zone given particularly to agriculture, but the population during and after the war became dependent on agriculture, on maize and beans to live; and that’s the reason why there is deforestation in the zone. The campesino has a unique way of life with farming and one in which you can’t live by trees; so you have to fell the trees in order to sow the maize. And if we return to the indiscriminate use of chemicals after the 1990s in this zone, in order to increase production, then unfortunately we’ve had to make use of those chemicals. As an agricultural zone, we have continued to use chemicals for the maize. Since a while ago, COMUS has been trying to increase awareness about the need to reduce the use of chemicals. But deforestation is a result of agriculture. COMUS’s programme is more in the higher zone which is more vulnerable to lava flows and to erosion. We’ve made great efforts to maintain the coffee project because it’s through maintaining this project that we can prevent deforestation in the high zone. There are particular efforts, as Estela was saying, in the certified plots, demonstration plots with vegetable production, and it’s in these that we are promoting fruit trees. JC: It’s worth mentioning, as the others were saying, but there’s also a more global idea. If we remember how things were here before – I mean in the 1950s – from San Francisco Javier and three corontos further down, that’s where the coffee fincas began. The coffee fincas reach up to Alegría, 25 corontos higher up. There was plenty of vegetation and at that time there was a lot of work. What happened with the havoc of the war and the bombings and the 500 pound bombs and the scorched earth technique? Well, more than 2,000 manzanas of coffee were recovered in this zone. Then the Peace Accords came along. The struggle then was how to make these lands sustainable for the communities that lived in the area covered by COMUS. From that came everything which Chico and Estela have said. Five years ago there was a classification of coffee where they tried to maintain a standard quality of coffee, but today with climate change it’s necessary to take …?? ?… the coffee, as I said before, 300 or 400 meters, to move up to 600 meters. So the most basic coffee now begins between 600 and 800 meters. What’s below that? It’s the inferior coffee. So in economic terms you do the numbers, and with the crash in the coffee price, and with what you pay the big exporters for your cup of coffee – well, at times, it’s not viable. But the producer carries on producing. So the challenge for COMUS is how to deal with this and how to ensure that they don’t fell their trees and that they make their plots profitable and provide food for the family. MM: I was going to ask about global warming. Have you experienced any effects here? CP: For the last three years here we’ve been feeling the effects, but we haven’t given it our major attention and it’s only in the last year that we’ve begun a process of training about global warming and climate change. In October or November of 2009, there was a huge tropical storm, Aída, which hit one place in particular, Verapaz, and left it really …?? ?… So, we began to realise that these are climate change effects which can affect just one area and deal it a major blow. And this year our winter has been a little unusual, if we can say that, because it began with the rainy season from the 30th April / 1st May for fifteen days of rain when we had a lot of rain. Since the 24th May, it hasn’t stopped. There almost hasn’t been a day or night when there has been a downpour. This month [July] is the month that for us is normally a dry month in this zone, but now there hasn’t been a dry month. This is how we are feeling the effects of climate change, and that has significance for the farming, and particularly in the case of the bean. Most years the campesino sows the beans in May. Now we’re seeing truckloads of beans being put away, which is when they should be taking them out. As for maize and its fertilisation, as the fertilizers have no effect on it, the very small milpas find the effects are that it becomes yellow and scorched through the middle. That means that a good part of the farmers are now going to feel the losses thanks to the climatic effects. EA: Last year we could see it in the growth of the coffee. In November, when we had Tropical Storm Aída, the crops were grown and ready to cut. But we had so much rain in eight days that it ripped out the grain and that caused a huge loss. Particularly for the small producers, that is really difficult. Like Francisco [Chico] said, with all the rain and throughout this winter with so many storms passing through – and we’ve only seen the tail-end of them – it’s almost irreversible. But even so, I think we have to make an effort to see what type of seeds we can work with, what type of plants and what other possibilities we have to be able to work with the producers to improve their food security. MM: One last question about the land titling. EA: For COMUS that’s a right for which we were formed and for us it’s an important axis of our work since our foundation, and it has been maintained. One of the people who we could mention has been important in shaping this problem is someone from here in the community, colleague Francisco Lemus (Chico), who has given a lot to the communities. It would be interesting for him to show it from his experience. CP: Just to say a little about land titling, one of the problems which came out of the armed conflict in this country was the land ownership and the concentration of land in few hands. With the struggle there was a good group of families, 450 of them, only in this zone, managed to obtain property titles. From the time when they took over the lands, COMUS accompanied them right up to their becoming legal and with their title deeds in hand. It was in 1994 when that process was managed. But from 1995 for this zone we believed that the problem of the legality of the lands had been resolved and was finished. Eight or ten years passed and we didn’t give much emphasis to the land issue, but after the earthquakes  we began to discover that in this zone the families had obtained their lands under the famous agrarian reform. With the agrarian reform, land was given to the campesinos, but at the same time they acquired a debt; so the cooperatives sold their land in order to pay off that debt. So the land was given to other campesinos and they got the debt with the land titles. Since 2003, COMUS has re-adopted the problem of land titling and we’ve been faced with loads of families and cooperatives who now have the problems of the legality of their land with the ILPE. Because of the debts they have, these are big problems. They cannot pay the debt, so they can’t get their title deeds, and so now COMUS is running a process of accompaniment and doing socio-economic studies with the families so that they can demonstrate that they cannot pay for the land, and in this way to see how we can resolve the problems of legality. The accompaniment in this process of land titling is still continuing and we think that it’s not going to stop. We believe that with the change of government it’s going to be a bit more flexible and easier to resolve the legal situation of the families. But we keep on meeting these inherited traps which were left by former governments twenty years ago, and it’s not easy to resolve the problem.